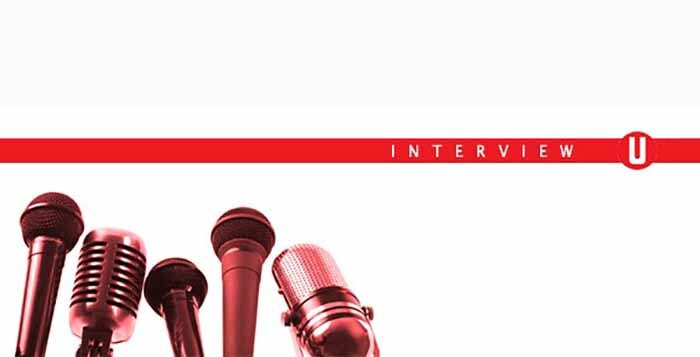 FIFA U Team is very proud to bring you here a very special interview. David Bytheway, the best FIFA UK player of the decade, was kind enough to take a few minutes to talk with us. It is your chance to get to know one of the top FIFA players around and to learn what do you need to do to improve your skills. For those who don’t know, David Bytheway is a 21 years old Professional FIFA player, from Wolverhampton, who believes that it is possible to making a living playing FIFA. Since FIFA 09, his first true game of the most successful EA Sports franchise, there are more and more tournaments, sponsors and prizes. He also plays wager money matched to sponsor himself. Fan of Steven Gerrard, David started to play FIFA just for fun. Then, he realised that he was better than the average players and that’s when he started to play more and challenge other top gamers who have introduced him to professional teams. He tried a few ones until he settled in one of Europe’s biggest eSports teams, TCM-Gaming. 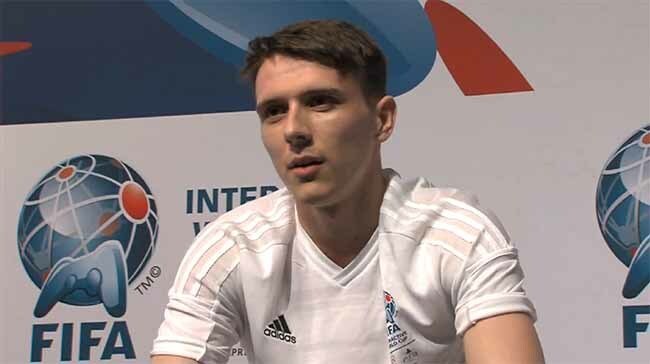 He strongly believes that, to improve his FIFA skills, it is more important to play a few games against top players than many games against average players. In his opinion, he is not challenged when he plays FIFA against someone he finds on the net. To play real football is part of his training as a Pro FIFA player. It helps him to make in game decisions quicker based on his knowledge of the real life game. David plays a fast attacking football style, usually in 4-1-2-1-2 or 4-2-3-1 formation depending of who he is playing. His preferences are fast and strong players. Real Madrid and Bayern Munich are his favourite clubs in FIFA. The biggest success in his professional career, was the FIFA Interactive World Cup 2014 Grand Final second place. Just to give you an idea, FIWC has been awarded the Guinness World Record for being the largest gaming tournament in the world. This year, there were over 2 million players and being number 2 is something really amazing. He had 9 months training and qualification, so he could go to Rio de Janeiro as a top 20 finalist. He beat higher seeded opponents with better seeds, as Ovidiu Patrascu, and he was so close to winning the final against August Rosenmeier. Now, that you already know him better you can watch his live stream here or see what he shared with us. FIFAUTeam – Thank you David for giving us this chance to talk with you. Congratulations for your FIWC performance. David Bytheway – Thank you. FIFAUTeam – Let’s start with this competition. It was your first time in this tournament and you almost won it. You usually say that it is all a matter of practice but there must to be something more. Do you feel that you have a natural predisposition to this game ? How do you did it ? David Bytheway – Yes, I definitely feel like I’m naturally good at the game but I don’t like saying it because it sounds incredibly arrogant. Throughout my childhood I was hooked on football games. It started with FIFA 2003, then I played PES and I was always pretty decent at them despite being very young. When I first got my XBOX 360, the main game I played was Call of Duty 4. However my Mum wouldn’t buy me the next edition until Christmas so I had a few months to wait. In those few months I decided to give FIFA a go and right away I seemed to be good. From there I played it even more and eventually got to the stage I’m at today. FIFAUTeam – Bruce Grannec is a reference for you ? How it was to have a better performance than him ? Do you think in the near future you may be a reference for other professional players ? David Bytheway – I wouldn’t really say I have a reference. With FIWC it was always a case of qualifying so I could determine how good I actually was. It’s always nice to finish higher than someone who is known for being one of the best at the game and definitely gave me more confidence in my own ability. As for being a reference, I think if I improve my game that little bit more, there will be people who see me as a reference. FIFAUTeam – You were in many amazing cities around the world like Paris, New York and Las Vegas, just to play FIFA. But this time you got the full package: you have played football on the Copacabana beach, have visited Christ The Redeemer, have watched a world cup match, have played the finals at Sugarloaf Mountain and have met the Brazilian Ronaldo. How can this get any better in the future ? David Bytheway – It’s hard to improve on an experience like we had in Rio. It had it all. I remember speaking to a friend of mine a couple of years ago and we were discussing the world cup. We were saying how unlikely it is that we’ll get to go to a world cup in the next 20 years because of the locations. Just 2 years after the conversation, we were in the Maracana watching the yet to be crowned champions beat France 1-0. FIFAUTeam – You were in Maracana, watching the World Champions Germany against France. What was wrong with your team England in this World Cup ? Bad luck ? Difficult group ? Not enough quality ? Too much pressure ? David Bytheway – England are not good enough, its just that simple. We haven’t produced enough top quality players compared to other countries and I think going out at the group stage is what we deserved. The pressure on England is always high but this year I think its the lowest it’s been in a while and even then they didn’t perform. FIFAUTeam – This year’s FIFA introduced a system where two players could not use the same team. Before the tournament you had to select the two teams, in order of preference. Brazil is in your opinion the best team in FIFA World Cup video game, but you picked Germany as your first option because most of gamers wouldn’t do it. It was a smart move to avoid you to have to switch teams during the tournament. Do you use any other tricks to get slight advantages when you play ? How much important is intelligence in this game ? David Bytheway – I thought it would be a smart trick but it seems I wasn’t the only one who thought of it. I don’t tend to use any other tricks to get an advantage, I like to think my ability gives me enough of an advantage and that’s all I need. In most tournaments there’s not really a lot you can do in terms of team choice. We see Madrid vs Madrid a lot and in that situation. It’s just down to who has the luck on that day. FIFAUTeam – We know that you believe in quality over quantity in terms of who you play. But playing 5 to 8 games per week against other top class opponents as FIWC training seems not enough to most of FIFA enthusiasts. Why not play 50 games per week against top quality players ? David Bytheway – When two top players play each other, the game is often decided by a stupid moment of luck which is infuriating for the loser as most of the time it’s something out of their control that decides the game. It’s also down to time difference and when both players can be on at the same time. We don’t tend have a wide variety of players who we play, just 2 or 3. So most of the time it isn’t down to choice, it’s simply down to when we can play. Playing 50 games is possible but really isn’t needed. Once you get used a FIFA title, it’s mainly down to staying sharp and finding little things that work better for you. All that can be done in 5-8 games against a top player. FIFAUTeam – The place with the most FIFA players in the world is the UK. In your opinion, why there are so few well successful professional players in UK ? David Bytheway – I think that the UK has the best FIFA players out of any other country. The reason why I think we don’t have that many is because of games like call of duty. We might have a lot of players but most of them switch between games like that and perhaps get good at both but not great at one. FIFAUTeam – According to you, FIFA isn’t always about how good you are at the game. It also requires a strong mentality. Knowing how to handle the pressure, not letting your emotions have an effect on the game and right decisions making seems to be more important to you than the players’ skills. Do you think that most of players overlook the importance of mental strength ? It can make the difference even between amateur players ? David Bytheway – Mental strength is definitely greatly overlooked. Bruce Grannec is a great example of this. 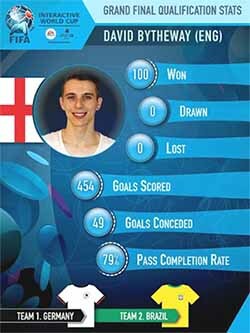 On pure ability, I don’t think he’s ever been the best (he’s still great) but I think there have been players at FIWC tournaments who have perhaps had the edge on him in pure ability. However, he has the whole package. He is emotionless and incredibly strong mentally which separates him from the rest. The pressure that you feel is extreme and coping with it as well as trying to play your best is extremely hard. Even between 2 average players, it will make the difference. FIFAUTeam – Most of the tournaments were played in Playstation 3. When do you plan to go to Playstation 4 ? David Bytheway – I have had my PS4 since about April but didn’t play it because of FIWC being on the ps3. Now FIWC is over, I’m going to start playing it. FIFAUTeam – You are sponsored by PCM Gaming who pay your expenses. How will being number two in FIWC 2014 help you to get new sponsors ? Imagine, that I am a company that are willing to sponsor you. What do you have to give me and how can I do it ? David Bytheway – I can’t really answer this question, not many players get individual sponsors, it’s rather the team use my name to attract new sponsors. But I don’t know anything about it. FIFAUTeam – In a general way, FIFA Youtubers are more popular than professional gamers. What is the reason for this nonsense ? Is EA Sports responsible for this ? What has to be done to the community have easier access to professional players ? David Bytheway – Youtubers and streamers are a lot more popular because they make FIFA fun. That’s pretty hard because FIFA is extremely boring to watch. As a pro, we have 1 goal, to win. Doesn’t matter how pretty the victory is, that’s the only thing we care about. You can’t really put it all down to EA but for sure there’s things they can do to make the game more appealing. FIFAUTeam – Where do you see yourself in ten years ? David Bytheway – It’s hard to say. I hope to go back to university or pursue a career path I feel I will enjoy. For sure I’d like to make a living off FIFA but it’s extremely difficult. Who knows, I might even be able to get a job with EA ! FIFAUTeam – Many FIFA players around the world become aggressive when they play FIFA alone or have some kind of superstition. Is this something familiar to you ? David Bytheway – Many controllers have been against my bedroom wall and many other things have been broken. It’s possibly the most frustrating game in the world. FIFAUTeam – Let’s say that I want to be a pro. What do I have to do, step by step ? 3. When you feel that you’re good enough, find and enter offline tournaments. Offline tournaments is where it’s at and if you perform there, that’s when a sponsor will pick you up. FIFAUTeam – We know that you usually don’t play Ultimate Team mode. However, could you say to us your opinion about handicap ? It really exists ? David Bytheway – There is always going to be a handicap on ultimate team. It’s rare you will get a game where the teams are uneven. As for weaker teams being worse than what they should, I don’t think that’s entirely true. I think if you’re playing against a good team, you will expect your players to take chances because your opponents strikers have. It’s still in your own hands though, I have played ultimate team matches with an average gold squad against a team of “In forms” and so on and still won with ease. FIFAUTeam – What do you think about FIFA U Team website ? David Bytheway – The FIFA U Team website is great. It has some amazing content and I look forward to working more closely with you guys. FIFAUTeam – One last request. Can you share with us your FIFA dream team ? Who are your favourite players for each position ? David Bytheway – GK: Neuer, RB: Dani Alves CB: Ramos & Thiago Silva LB: Alaba. FIFAUTeam – Thank you David for your time. It was a pleasure to meet you. Good luck to the upcoming tournaments. David Bytheway – Thank you too.